Allied Plastics team of Engineers is dedicated to creating you the highest quality Plastic Thermoforming. They will work side-by-side with you from Plastic Vacuum Forming project conceptual design through first part approval, tool machining, prototyping, and production run start-to-finish. A Project Engineer will be assigned to your Plastic Thermoform Engineering project to ensure that all dates are met and specifications are obtained. Allied Plastics creates a highly Engineered solution to fit your Thermoforming need. Whether you need a new design, a current specification match, reverse Engineering or assembly ingenuity, we will find the Thermoform solution for your project. Our skilled Design professionals use state of the art equipment and ProEngineer 3D product design software to ensure your Custom Vacuum Formed Plastic product will be manufactured to your exact requirements and specifications time after time. We can accept many popular CAD formats using PS-Exchange which is a powerful stand-alone CAD translator program. 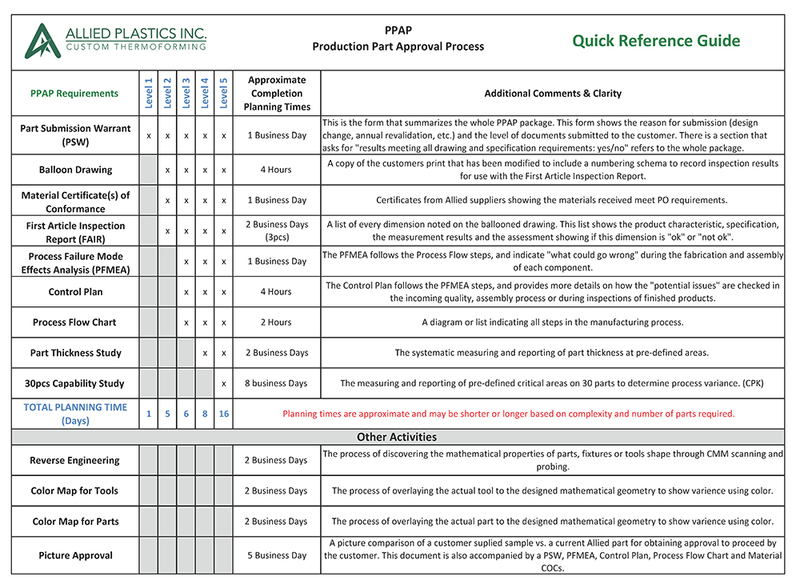 Allied Plastics Engineering Production Part Approval Process (PPAP) Quick Reference Guide for customer Vacuum Form projects. Click the image below to review a downloadable PDF. Chat with an Allied Plastics Engineer expert from 8 am to 4:30 pm Central, Monday through Friday. Open the Chat Box below or email us at sales@alliedplastics.com. Need a quote? Please fill out our quote request form or call us directly at 1-888-870-8158.